The art piece I created is a visual representation of the concept of creation from a Lurianic point of view. Having read on the subject during the semester, I felt that the only way to understand the concept was to see it in a more visual form. Isaac Luria, born in 1534, was considered one of the greatest Kabbalists of his time and in the development of Kabbalah. He amassed followers that were dedicated to his vision and although he did not write many of his concepts down, as they were so vast and beyond the scribblings of a pen, he influenced a large portion of Kabbalah and the way people interpreted it[i]. As discussed in class the Lurianic perception of the worlds creation rests on the basic questions that many of his time reluctantly asked, such as; why does God exist and why did the creation occur? [ii] His core concept behind creation was the idea that creation itself was imperfect and its purpose was to correct the inherent crisis within God[iii]. Luria suggested that in order for creation to occur God or Ein Sof had to remove himself from a space, since he was everything and all, creating Tzimtzum. From this space of nothing a divine light shone through to the middle flowing into vessels or the Sephirot, which, unable to contain such divinity, broke, losing the divine spark within[iv]. There are multiple representations depicted in my drawing that help to visualize the Luria’s concepts and make them more accessible to the mind of the viewer. Beginning with the concept of Tzimtzum, I used the inner part of the eye, the iris, to represent this part of creation where God must remove himself or as discussed in From Metaphysics to Midrash where “…an outward emanation of the divine must be preceded by a receding of the divine within itself.”[v] Or a voluntary self-limitation like a vacuum that creates a space or void with God’s emanation in a lesser brilliance. In Luria’s further discussion of the divine light that shown through the middle I actualized this concept by depicting the yellow in the drawing, which also contains the Sephirot, as the divine light. The yellow begins from an opening in the top part of the iris and continues down to the centre point of the Tzimtzum, where the pupil would naturally sit, representing the middle point of Tzimtzum and a visual conception of creation. The Sephirot are the next phase in the drawing and in the concept of creation. The Sephirot, as discussed in Back to the Sources: Reading a Classic Jewish Text, are purportedly the outer layers of the hidden dimensions of God, containing the divine light that began in the Tzimtzum. They work as the “rays of the sun” in relation to the divine light. 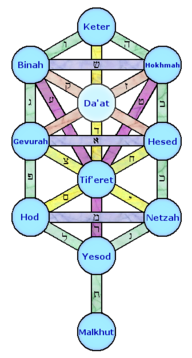 [vi] There are ten Sephirot all representing different aspects of the divine, the highest three being Keter, Hochmah and Binah with the following seven named Hesed, Din, Tiferet, Nezach, Hod, Yesod and the final Sephirah named Malchut. Each vessel contains an either masculine or feminine “energy” and multiple characteristics. [vii] Although it is difficult to represent the Sephirah in one visual, I had them represented by circles within the picture placed in the order they are normally depicted so the viewer will know which circle is representing which Sephirah. The tree and its reflection are representations of both the concept of the Kabbalah tree of life, based on the Sephirot, and the world, as we know it. In relation to the Sephirot tree of life, the tree is placed in the centre as a representation of the focus on conscious knowledge and awareness but in a more actualized and realistic visual, depicting a “real” tree intertwined with the Sephirot. The tree has been known to represent life in multiple religions and philosophies and it also plays a role in connecting the creation of the universe and the story of genesis with Adam and Eve and the tree of knowledge, hence the placement on the left side of a fallen apple. In understanding this concept of the “Tree of Life”, one may be able to understand the structure of the universe around us and within us, as it works like a map in representing parts of the universe, hence why the placement of the tree is in the pupil of the eye as a central focal point. The bright colours within the middle of the iris (around the pupil) are to represent the forming of creation, a fire-like aspect in my own conception of creation and continuing into the sky and the wind, represented by the outer blue edges. The lower half of the iris represents the female Malchut, as can be seen by the juxtaposition of the Sephirah and the colours representing the Sephirah. It also represents a mirrored world, which I tried to convey through a similar depiction as the top part of the iris; however it sits in an underground, water-like world, darker and therefore lacking in as much divine light. The placement of the flowers on either side of the great light that is meant to “emanate” from the centre is another connection to Genesis. The Garden of Eden, due to its description as a beautiful and lush place, is represented in the drawing through the flowers that are symbols of vitality, beauty and growth. I chose to have the concept of creation within the depiction of a human eye based on my own interpretation of the Lurianic creation theory. To me the idea of creation is more representative of the human development in their own consciousness, the eye is meant to symbolize the mind’s eye, where thoughts, feelings and emotions are projected and the sense of being connected to God can be felt and recognized. The eye also reflects the connection of the Sephirot to the actualization within the human body and its development within a person, such as the desire of Tikkun in fixing the Shevirat ha-Kelim. Dan, Joseph. Kabbalah: A Very Short Introduction. N.p. : Oxford University Press, 2006. Print. Fine, Lawrence, and Barry W. Holtz. Back to the Sources: Reading the Classic Jewish Texts. New York: Summit books, n.d. Print. Giller, Pinchas. Reading the Zohar: The Sacred Text of the Kabbalah. New York: Oxford University Press, 2001. Magid, Shaul. From Metaphysics to Midrash: Myth, History, and the Interpretation of Scripture in Lurianic Kabbala. Bloomington and Indianapolis: Indiana University Press, n.d. Print. [i] Dan, Joseph. Kabbalah: A Very Short Introduction. N.p. : Oxford University Press, 2006. Print. [vi] Fine, Lawrence, and Barry W. Holtz. Back to the Sources: Reading the Classic Jewish Texts New York: Summit books, n.d. Print. [vii] Giller, Pinchas. Reading the Zohar: The Sacred Text of the Kabbalah. New York: Oxford University Press, 2001. [viii] Dan, Joseph. Kabbalah: A Very Short Introduction. N.p. : Oxford University Press, 2006. Print.